Hartlepool United manager Ronnie Moore says deadline day arrivals Marvin Morgan, Scott Harrison and David Mirfin give the squad useful experience. 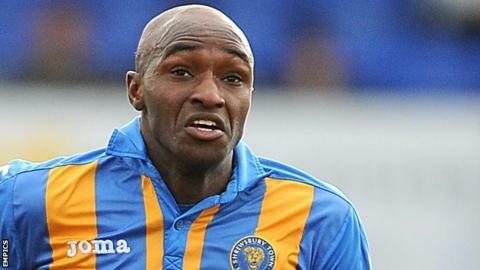 Striker Morgan, 31, arrived on loan from Plymouth to replace Rakish Bingham following his recall by Mansfield Town. Defender Harrison, 21, signed a full-time deal from Sunderland while Mirfin, 29, moved on loan from Scunthorpe. "We've now got options, not just on the 11 who play, but also on the bench," Moore told BBC Tees. "We've got a better squad of players now that when you look at the bench, it's not just young kids. There is experience on there that can make us better." Harrison has committed to Pools, despite the current battle against relegation from League Two, having initially joined on loan from the Wearsiders in August. "He knows the position we're in but he wanted to come to the club," said Moore. "He can see we're trying to do the right things, we're working hard bringing players in and I think he realised the situation. "We tried to speak to a lot of players but an awful lot of players turned us down. It's disappointment for us."